more or less spherical and not flat. Note that the image shows that extreme western part of Australia in total darkness. But, a short distance eastward (counter clockwise on the above image) in Australia, the land is in full sunlight. If the Sun were in this configuration, it would be daytime over the entire surface of the Earth for 24 hours a day. That is, any person anywhere on Earth, 24 hours a day, would be able to look somewhere between their horizon and overhead, and see the Sun at any time! Some would see it directly overhead. Everywhere else the Sun would be visible at some location between the horizon and overhead. No part of the Earth would ever be in darkness. Sunsets and sunrises would never occur. This model cannot be accurate. There is no focusing device between the Sun and Earth. There is no device above the Earth that would cause a well-defined border between an area of full sun and the rest of the earth in full darkness. This model clearly violates so many daily events that it cannot be valid. To visualize this, imagine a circular table that is flat on top. It would simulate a flat earth. Imagine a burning marshmallow being moved around the the table at a constant distance above the table. This would simulate the motion of the sun, moving around a Flat Earth every 24 hours. Finally, imagine an ant on top of the table. The ant would see the marshmallow continuously, all the time; it would never experience darkness. 1 AM in Hawaii, in darkness. 4 PM in India, during the afternoon. If the Earth were flat then humans in Greenwich would not experience noontime with the Sun overhead while humans in the central Pacific Ocean experienced midnight -- with the sun out of sight. If you are at New York City, in the Eastern Time Zone, at Noon time, then you would find the sun high in the sky. You could phone a friend on the West coast of Australia and ask what time it was and whether the sun was visible there. That location is approximately on the other side of the world. They would say the sun set many hours before and it that is the middle of the night where they are. This would make sense if the earth is close to a sphere in shape and rotating. It would have 24 time zones. If it is daylight on one side of the Earth, it would be nighttime on the other side. But if the Earth were flat, and the sun was overhead in New York City, the sun would still be visible from New Zealand and Australia and everywhere else in the world. A lunar eclipse occurs when the Earth is directly between the Sun and the Moon. By looking at the moon, we can see the shadow of the Earth creeping across the moon's surface. The shadow has a rounded edge indicating that the shape of the Earth is also round. Successive lunar eclipses always show the same rounded shadow. The only Earth shape that always casts a round shadow is a sphere or a shape close to a sphere. It is a well established fact that objects with mass attract each other. If one places a spherical ball on a horizontal surface of a roughly spherical Earth, the ball will be attracted to the center of gravity of the Earth, which is close to the center of the Earth. It will stay put. Thus persons at the North Pole, Ottawa, Orlando, Mexico City, Brasilia, Buenos Aires, the Straight of Magellan or South Pole would all see their ball sitting stationary. 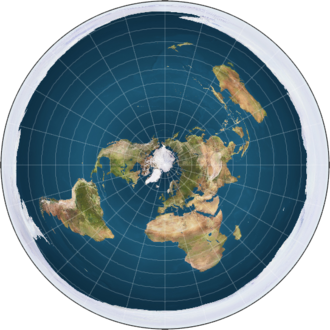 If one places the same ball on a horizontal surface on the edge of a flat Earth, then the apple will still be drawn towards the center of gravity of the Earth. However, the center is roughly in the center of the flat Earth. It will tend to roll towards the center of the Earth which most flat Earthers believe is at the North Pole. The ball will roll in a Northerly direction towards the pole. Try the experiment the next time that you are some distance from the North Pole. You will find that the Earth is spherical. Most believers in a flat earth assert that artificial satellites simply don't exist. They are believed to be gigantic hoaxes perpetrated by NASA and by space agencies of other countries. But there is "something" about 240 miles above the surface of the Earth that is revolving around the earth about once every 90 to 93 minutes . If you know when and where to look, you can find it as the second brightest object in the night sky. (The moon is the brightest.) Many people have successfully photographed the ISS from the Earth. The direction and degrees elevation when the ISS will vanish from view. By tracing data for a single pass of the ISS over the surface of the Earth, one can verify NASA's claim that it takes about an hour and a half. In fact, every satellite in a low earth orbit from Sputnik in 1957 to the ISS today takes about that many minutes to circle the Earth. By tracing NASA's data over a map of an approximately spherical Earth, one can compute that the ISS is traveling about 17,000 miles per hour or 27,000 km per hour. This is obviously well beyond the speed of any airplane that has ever been built. The only logical conclusion is that it is a man-made satellite revolving around the Earth, placed in orbit by a rocket. Another proof of that the Earth is not flat can been shown by actually surveying Antarctica. If the Earth is flat, as shown in the above diagram, then a ship passing along the shoreline would have to travel about 50,000 miles to make a complete circuit before it would return to its starting point. It clearly does not have a 50,000 mile coastline in the form of a narrow ribbon. It is a roughly circular continent, approximately the area of the United States and Mexico combined. 5 The continent has been circumnavigated by ships and overflown by planes countless times. Antarctica is the most sparsely populated continent in the world, with a typical population density of 0.00078Â people per square kilometer. Its largest settlement is McMurdo Station, located adjacent to the Ross Ice Shelf and the Ross Sea. It is operated by the United States Antarctic Program. Its peak population is about 1,000 persons during the summer months. An Antarctica Cup Ocean Race is held annually. It is a "non-stop race of around 14,000 nautical miles" that is "open for Monohull and Multihull ocean racing boats, crewed and solo." It takes on the order of 40 days to complete. 8 The racetrack is a strip of ocean that is 900 nautical miles wide between latitudes 45 South and 60 South, except for the region near Cape Horn at the tip of South America, where it narrows considerably. The wide racetrack allows for crews on individual boats to catch the optimum winds and maximize their speed. Anyone associated with the race, whether crew member or organizer would be quite aware that the race only extends over 14,000 nautical miles and not 50,000 miles. The following information sources were used to prepare and update the above essay. The hyper-links are not necessarily still active today. Map of Antarctica, http://ian.macky.net/ In the public domain.